It may be 18 degrees outside, but that's no excuse not to get all drunk and sweaty, NOLA-style. 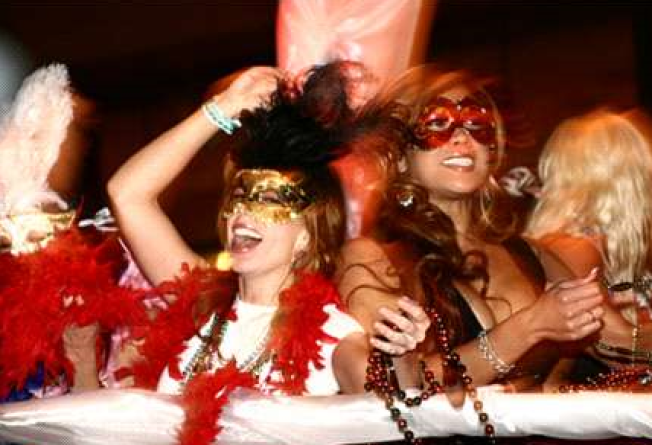 Fat Tuesday: Beads, booze, and music straight outta Bourbon Street. Brooklyn's Bell House becomes Bell Maison for the night. Party with the Sugartone Brass Band and scarf jambalaya from Great Jones Café, starting at 8PM. The Village Pourhouse on Amsterdam at 108th will be throwing beads aplenty - especially once the $10 all-you-can drink special (house liquor, Bud) kicks in at 5PM (until 8). There'll be a big old crayfish boil in Abita beet at Hell's Kitchen's newish Nawlins-themed Bourbon Street Bar and Grille. The Sugartone Brass Band plays during happy hour (from 5:30) before heading to Brooklyn. There'll be a whole mess of Cajun goodies at Acme Bar: zydeco, Abita and other NOLA brew specials for $5, and much more. Great Jones Café doesn't need much of an introduction. Go there tonight for a special Fat Tuesday menu (including king cake), cheap Hurricanes, and one of the best jukeboxes in the five boroughs.